Hello and greetings and tidings of exciting news! I’m thrilled to announce that I’ll be giving an Intro to Writing Romance workshop at the Terrace Public Library, Thursday, November 23rd from 6:00 – 8:30. Admission is FREE (Yes, you read that right! 🙂 ), thanks to the generosity of the event’s organizers and sponsors, the Federation of BC Writers and the Terrace Public Library. However, you must register in advance and there are limited seats. If you’re interested, book your spot now: 250-638-8177. 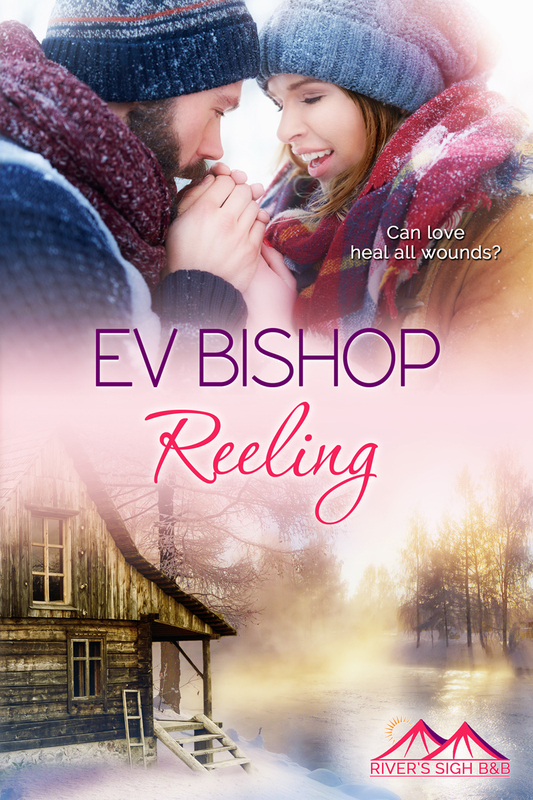 If you’re currently writing romance (in the closet or out, LOL), have always wanted to but haven’t started yet, or are just curious about the genre in general, this workshop’s for you. We’ll have a blast, I’ll talk your ears off, and you’ll leave buzzing with energy, inspiration and information. (Or that’s my plan and hope anyway. 😉 ) I hope to see you there! P.S. The writing life can be isolating (is of necessity, actually), yet at the same time, almost without exception, we accomplish more and feel happier when we’re part of a community. If you’re a writer yearning for a tribe or in need of fellow writerly chat and support, consider joining the BC Federation of Writers. They are an amazing source of information and opportunities, well worth their modest annual fee. And a little closer to home . . . If you’re writing in Terrace, BC (or area) and want to be part of a dynamic, supportive writing network, check out the Terrace Public Library’s writing group. Contact Jess for more information: 250-638-8177. P.P.S. I’ve had a few people ask if this workshop would be valuable for writers working in other genres. My answer is a hearty YES! It is a romance workshop and that will be my total focus, but there will definitely be takeaway information and advice applicable to whatever you write. Okay, so it’s mid-June and I keep thinking May’s just wrapping up, LOL. Oh well, at least it’s been mostly good things keeping me busy. 🙂 In fact, I had wonderful news in May, three times over! One of my poems (“Irregular Shapes”) received an honourable mention in the Shuswap Association of Writers’ 2016 Askew’s Foods’ Word on the Lake Writing Contest (Poetry category), and my essay “Birthing Relationships” won second place in the same contest (but in the Non-fiction category). Woot, woot! I’m so grateful to all the industrious, art-minded folk who support and nurture literary arts. Last but not least, if you live in the Terrace area and fancy an evening of reading and chat for a good cause, I urge you to come out to “Words of Welcome,” a group reading/fundraising event, at the Terrace Public Library tomorrow night (7:00 p.m., Tuesday, June 14, 2016). Eden Robinson, Adrienne Fitzpatrick, Al Lehmann and I will each be reading a short excerpt or two from a published work or work-in-progress, and will be on hand for a question and answer period. Entry is by donation, with all proceeds going to the new families moving into Terrace from Syria. It promises to be an entertaining, thought-provoking night–and it’s for an excellent cause. Please come! Wishing you . . . chutzpah! Whew, another year is almost behind us. Crazy. It feels like a week at most since I last sat down with my Year-At-A-Glance calendar and laid out what I wanted to accomplish in 2015, complete with a symbol key—but it’s time to do it again. And time to nag you to follow my lead, regarding whatever it is you want to do this year. Lucky you! I was talking to someone recently about my writing life. She commented on my “dedication” and “organization”—and added, “You are so disciplined.” Even reflecting on her words makes me want to duck my head and deflect the compliment. Dedicated and organized? Who me? Nah. Disciplined—ahahahahahahaha—good one. Except that it’s time—maybe past time, actually—that I face up to and accept this part of myself. I am dedicated to things I want to achieve and I love to work. I derive huge amounts of joy and satisfaction from what I do (whenever I’m not simultaneously overwhelmed by neuroses and insecurity, that is! ), and I believe that whenever possible we should pursue those things in life that make us uniquely us and make us happy. I used to worry this was selfish of me—but now I don’t believe it is. I’ve spent a lot of time around deeply unhappy people and . . . it’s sad and awful and takes years to recover from. Hopefully, I’m modeling something worthwhile to my children and miscellaneous other people. You don’t have to live between the lines drawn by other people; you can create your own. And you don’t have to fly off the rails, quit your job and move to Mexico either. It really only takes small changes to start working on the secret dreams and passions that burn in your belly. 3) Resiliency, or as my parents used to call it, bullheadedness. Someone, or a lot of people, will say you’re wasting your time or kidding yourself. Worse, your own fears, insecurities, and guilt complexes are going to try to shut you down. Don’t give in. Practice, run, write, draw, sing, play through it. Resistance is the strongest and the negative voices are the loudest before you start for the day. Once you settle into your task, they’ll shut up and slink off until next time. That’s it. No magic—but honestly, you don’t need magic. You just need desire, stubbornness, and the knowledge, hard as it is, that no one else cares if you do the thing you really want to do. Only you do. It’s not because they’re awful or because they don’t love or understand you. . . . It’s because some things are purely personal; no one else can truly know what you need to do. It’s up to you. Do it. Wishing you a wonderful New Year full of daydreams that shape reality, steps that become a path, and enough chutzpah that folks around say, Wow, what’s got into you? Just a short post today. This past Friday I had the delightful fun of taking part in a live radio interview with the wonderful and talented Sheila Peters. I was sooo nervous beforehand, but once we started talking it felt just like having coffee with a kindred spirit, discussing my favorite things. I could’ve gone on much longer–not that that surprises any of you! Gorgeous Hudson Bay Mountain, casting the shadow the radio show is named for. Photo by Major James Skitt Matthews. Click the image for more info. April is national poetry month and since poetry has always been a great help and boon to me emotionally, I celebrate it. My dad had a love for Irish poetry and songs and old English verse, plus I was a fan of Robert Louis Stevenson’s verses for children, but Emily’s “A Formal Feeling” was the first poem (that I remember anyway) to strike a chord of recognition deep within me. By then I was already acquainted with sorrow—and for me, her words captured a truth that was difficult to put into words. She conveyed what sadness felt like and expressed a process I was learning. I don’t know how many times I reread the poem as a teenager (or have done so as an adult), but it continues to be one my favourites. Another piece that meant more to me than I can probably explain without a lot of melodrama is “First Ice” by Andrei Voznesensky. She breathes on her thin palms. Her fingers are icy. She wears earrings. I suspect you, having read it, know the phase of life I’d entered—first love, first heartbreak, yes . . . but I always felt the poem spoke to something bigger than one isolated break up. It was the disappointment that resonated with me: the girl, for the first time, recognizing that people weren’t always what they promised—and/or weren’t as honest or straight forward as she was. I could share many, many more poems that influenced me or comforted me (or just made me laugh; not every poem I love is sad! ), but I’ll spare you for now. I suspect you have your own poems or songs (and what are lyrics if not poetry?) that, no matter how long ago you came across them, still have profound meaning to you. In fact, I’d be willing to bet that you’ve even penned a stanza or two (or more), whether you consider yourself a writer or poet or not. Most of us have. There’s something in the human spirit that yearns to give voice to the emotions that move us and the passions that make us us. Now circling back to it being national poetry month—and my desire to celebrate it. If you’ve written poetry before but stopped for some reason, or if you never have but would like to—or if you’re a prolific pro looking for ways to invigorate and refresh your muse, honour those stirrings. 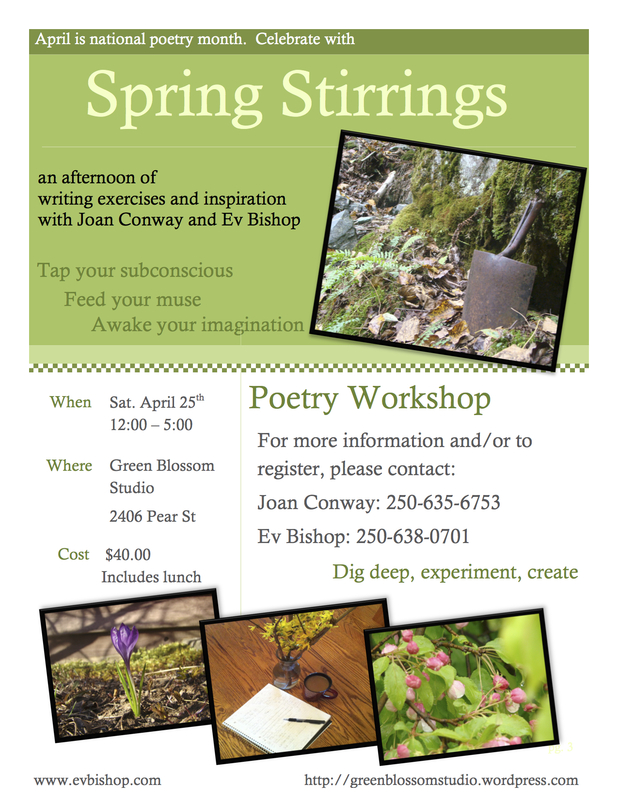 Join me and Joan Conway this Saturday (April 25th) for an afternoon of poetry exercises and inspiration. Reading at Prince Rupert Library, Thursday, April 16, 7:00 – I hope you can come! 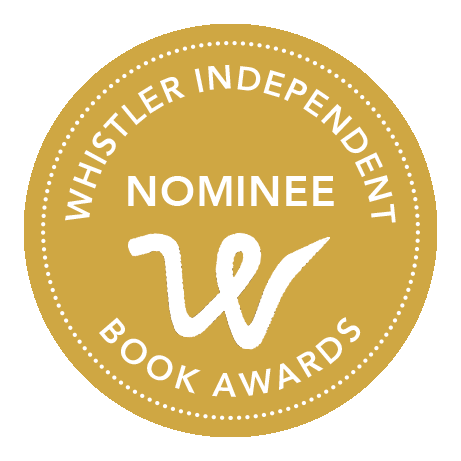 I’m thrilled to announce that I’ve been invited to take part in some super fun events over the next few weeks: An author reading at the Prince Rupert Library, Spring Stirrings – a Poetry Workshop (that I’m co-facilitating with Joan Conway), and an Authors for Indie Bookstores event at Misty River Books. I’ll post full details for each in the days to come, so keep a kind eye out if you’re interested. Kicking off the three, I’m calling for all Prince Rupert, B.C. readers and writers. 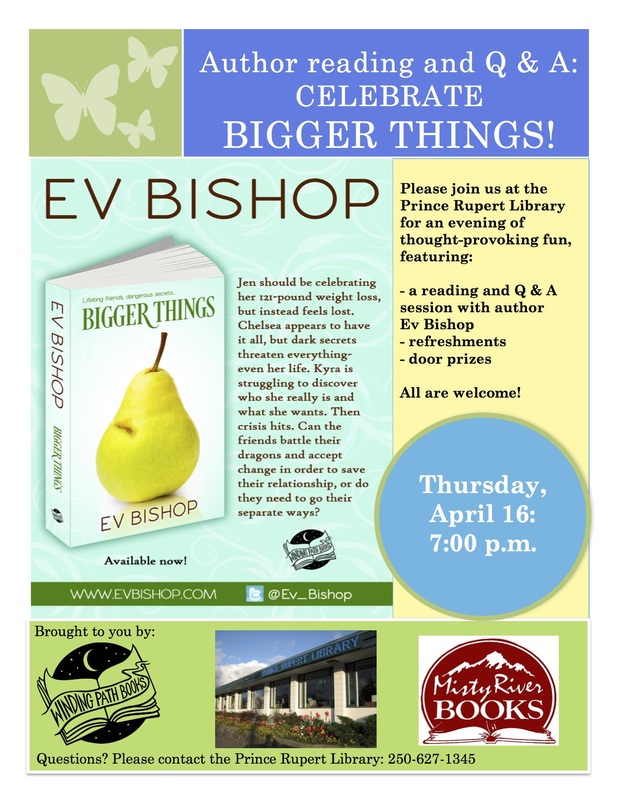 The Prince Rupert Library has invited me to do a reading and question and answer session, Thursday, April 16 at 7:00 p.m. I’ll be focusing on BIGGER THINGS, but will also have copies of WEDDING BANDS on hand. It should be a fun, thought-provoking evening (and there are great door prizes, lol). I hope to meet you there!